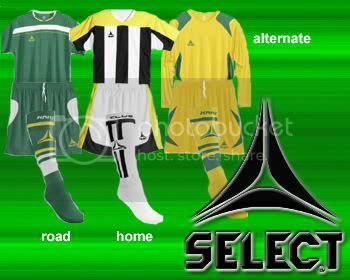 Yesterday the Rhinos unveiled their kit deal with Select and the kits that the team will be wearing in 2007. I hate to go all Mr. Blackwell on them, but what is going on with the yellow shoulders on that home kit? I think the all road and alternate kits look OK, but the home kit leaves much to be desired. Personally, I never liked the vertical black and white stripe look all that much to begin with. But this "traditional flavor with a twist" angle doesn't work for me. And I hope they didn't pre-order a ton of home jerseys to sell in the team shop. I could be way off, but I don't see these being huge sellers. Some good news on the kit front is that the Rhinos will be wearing a special edition kit for the opener on Friday. To raise money for the Virginia Tech Hokie Spirit Memorial Fund, the Rhinos will follow in the footsteps of the Houston Dynamo and DC United and wear special kits featuring Virginia Tech colors that will be autographed by the players and auctioned off with the proceeds going to the Virginia Tech Hokie Spirit Memorial Fund. The Rhinos kits will be black with maroon and orange trim and will feature the Virginia Tech logo on the front. That's what a lot of fans were saying when the Rhinos announced that Stefan St. Clair scored two second half goals versus Niagara University on Saturday afternoon. A Google search came up empty, so I asked the Rhinos who the guy was. Well, it turns out his name is Stefan St. Louis and he played last year at Oakland University, the alma mater of Rhinos defender Jason Perry. St. Louis is a 19 year old from Trinidad who was a part of Trinidad & Tobago's U-20 team during qualifying for this year's U-20 World Cup in Canada. St. Louis left Oakland University after his freshman year and is looking to start his pro career, possibly with the Rhinos. Chad Severs was named to the USL 2nd Division Team of the Week after scoring the game winning goal on Friday night in a 1-0 victory over Bermuda and assisting on the loan goal of the match on Sunday as Harrisburg traveled to Bermuda and was able to get six points from the expansion club. Josh Bolton started both matches in the Harrisburg midfield going the full ninety on Friday and playing seventy minutes on Sunday. In what would be a major coup for US Soccer if it were to happen, FIFA head Sepp Blatter has said that if South Africa is unable to host the 2010 World Cup, there are other options, including having the United States host their second World Cup Finals. - With Borussia Moenchengladbach and Kasey Keller's contract expiring after the season, Soccer Insider Steven Goff is starting the talk up about Keller to MLS. Personally, I think it would be a solid move. However, given the players that have already been signed to Designated Player contracts, it is obvious that at least a portion of MLS clubs are more interested in headlines than building a winner. Add in Joe Cannon's trade/theft to LA this offseason and I really wonder if MLS teams value the goalkeeping position enough to through DP money at any goalkeeper, even Kasey Keller. And that is unfortunate because I'd love to see Keller play in MLS. - Oakland A's owner and the potential owner of the San Jose Earthquakes Lew Wolff talks about how the deal with San Jose State fell apart. Apparently there is a Plan B that they are working. But it's a shame that they couldn't get a deal done that worked for both parties as the soccer fans in San Jose certainly deserve an MLS team back in the Silicone Valley. - And finally, LA Galaxy head coach Frank Yallop poo-poos any talk of a Zidane signing. But, you know that won't stop the Zidane to MLS rumors, right?